The Think 20 (T20) community will meet at the T20 Summit, where the engagement group’s officials will present the Communiqué to the Argentine G20 presidency containing its vision of global governance and public policy recommendations. It will be on Monday 18 and Tuesday 18 of September in the CCK in Buenos Aires. Additionally, the event will explore the topics investigated by the T20 Argentina Task Forces throughout the year. 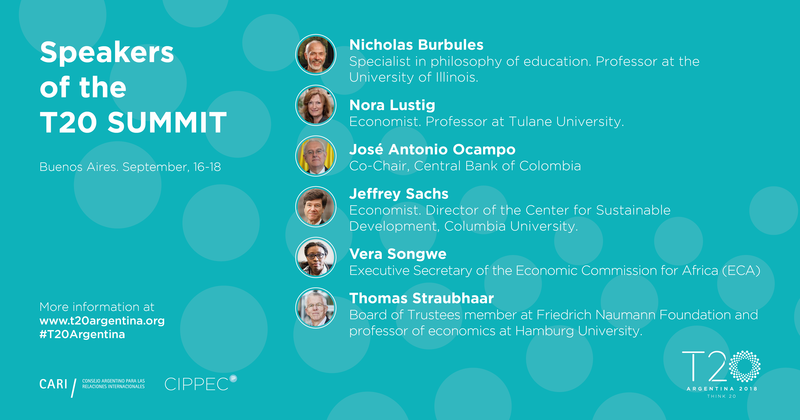 The six international experts will give the keynote speeches. Vera Songwe, José Antonio Ocampo and Thomas Staubhaar will participate in the opening address on Monday 17 at 09:30. The panel will be moderated by Felix Peña, vicepresident of CARI. Gerardo della Paolera, executive director of the Bunge and Born Foundation and member of CIPPEC’s Advisory Board, will present Jeffrey Sachs on the same day at 18:30. On Tuesday at 9, the Secretary of Culture Pablo Avelluto will present Nicholas Burbules, and at 18:00, Martín Rapetti will introduce Nora Lustig to the audience.